The discharge of improperly treated industrial chemicals and fuel gas can have a major impact on the environment, posing a serious threat to public health. Concurrent with the global growth of manufacturing operations to keep pace with market trends, many countries are taking measures to deal with environmental problems. In Japan, for instance, the Air Pollution Control Law and the Water Pollution Control Law require businesses to control toxic emissions. Both are revised periodically. To comply with government regulations and fulfill their responsibilities to society, businesses are upgrading their monitoring and control of waste treatment utilities, including waste water treatment and dust filtering facilities. Closed bodies of water such as lakes, inland seas, and bays where there is relatively little inflow or outflow are particularly vulnerable to water pollution. Eutrophication caused by organic pollution can lead to problems such as massive plankton outbreaks and red tides. With the implementation in 2001 of the fifth stage of the Japanese Total Pollutant Load Control Program, chemical oxygen demand (COD) restrictions were enhanced. In addition, nitrogen and phosphorus were added to the list of controlled substances as they are believed to be a cause of red tides. Respiratory function can be affected by suspended particulate matter. Volatile organic compounds (VOC), which were once widely used as cleaning agents in the manufacturing of semiconductors and other electric and electronic devices, are thought to play a role in generating photochemical oxidants. The Japanese government placed restrictions on VOC in 2004 when it revised the Air Pollution Control Law. When utility data is displayed on multiple instruments and/or recorders, blind spots can occur in utility monitoring. By bringing together this utility data in the STARDOM FCN/FCJ hybrid PLCs, this data together with other plant status information can be monitored and manipulated from the DCS HMI. This eliminates blind spots. From the central control room, which is manned around the clock, personnel operate and control the whole plant from the Distributed Control System (DCS) Human Machine Interface (HMI). By integrating into the DCS HMI the data and alarms from utilities, which are often monitored independently, the probability of an uncontrolled discharge of industrial effluents into a river is dramatically reduced. This also makes it possible to reduce the frequency of on-site patrols. In a new plant, the utility data can be integrated in the DCS HMI. Whenever utilities are revamped, the hybrid PLC logic needs to be modified. Although these changes can affect the operation of the DCS controllers, which handle the main process, no changes are made to the DCS logic. Modifying the DCS logic is not the solution to this problem. With an integrated operation architecture, the DCS logic does not need to be modified. The hybrid PLC data that has been modified as a result of the utility revamps can be accessed by the DCS via the System Integration OPC Station (SIOS). This enables the hybrid PLC data to be handled in the same way as the data from the DCS function blocks. Each time utilities are revamped, rewiring and re-engineering of the DCS controllers is required. This new architecture eliminates the need to rewire the DCS controller and modify its logic, reducing the overall cost of a utility revamp. This is made possible by the SIOS, which allows the hybrid PLC function ownership due to longer sensor prove life-time. Every time a new system is installed, personnel must undergo training to learn how to operate it. With the integrated operation architecture, this is not necessary because there is no change in how the data and alarms from the FCN/JCJ hybrid PLCs are handled from the DCS HMI. Also, the automatically generated FCN/FCJ tuning windows have the same look and feel as the DCS tuning windows. 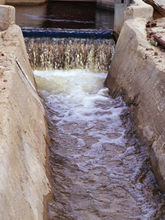 The monitoring and control system can cope in real time with emergencies such as the discharge of toxic effluents into a river in a remote location. Existing waste treatment utilities employ the following systems, depending on the facility scale and the treatment complexity. Instruments are installed on-site. Single-loop controllers and the like perform control as well as operation and monitoring functions, and data are stored on recorders. This system is employed with utilities located in remote locations, and requires regular site patrols. Relying chiefly on periodic on-site patrols does not allow real-time responses to emergency alarms. The inability to operate in real time makes it difficult to control the utility if the emergency level is raised. Readings are displayed on multiple instruments or panels, making oversights more likely. Data displayed on different panels cannot be integrated at a central location. The system is located far from the main plant and thus performs control and monitoring independently. On-site personnel or periodic patrols are available. When unattended, the system cannot respond to emergency alarms in real time. When there are multiple utilities, their statuses cannot be centrally controlled. Integrated management of the main and utility processes is not possible. Control is localized within the utility and only important data are collected and monitored from the centralized monitoring and control system. To comply with stricter regulations and accommodate data from an increased number of monitoring points, the DCS controller logic needs to be modified. Measurements for all monitoring points are input to the DCS. As both monitoring and control are performed the centralized system, the operator can make real-time responses to changes in the utility status. Changes to monitoring points and the utility's control logic require modification of the DCS logic. 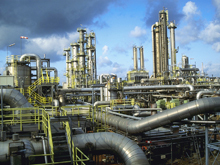 Control of both main and utility processes requires more complex DCS logic. The utility logic places a heavy demand on DCS resources CPU and I/O points. To overcome the limitations of conventional utility systems, Yokogawa proposes a new utility monitoring and control system architecture that seamlessly integrates hybrid PLCs with the DCS. The new system architecture can flexibly accommodate changes made to improve the operational efficiency of utilities. Via a system integration OPC station (SIOS), the function blocks of the hybrid PLCs (FCN/FCJ controllers) can be operated and monitored from the DCS human-machine interface (HMI), and the display of data from both systems has the same look and feel. And with the Consolidated Alarm Management System for HIS (CAMS for HIS), all alarm management is integrated. Both the data and the alarms from the FCN/FCJ are integrated into the DCS HMI. 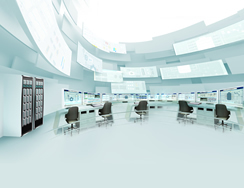 The monitoring and control of utilities by the FCN/FCJ controllers can be integrated into the DCS without having to change the DCS system logic or architecture. This is because the data from the FCN/FCJ hybrid PLCs passes through the SIOS, enabling it to be handled in the same way as the data from the DCS function blocks. Tuning windows for the hybrid PLC function blocks are automatically created in the DCS HMI. Specially adapted tuning windows for these function blocks are not required. There is an increasing need for a DCS with the ultra-high reliability required by plants. At the same time, the ability to raise productivity by flexibly improving and expanding subsidiary facilities and utilities is required. 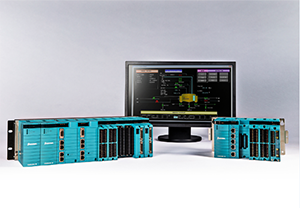 Distributing the facility and utility monitoring and control logic among the hybrid PLCs facilitates plant expansion and improvement, but with a conventional distributed system the DCS logic must be modified. Yokogawa proposes SIOS-based integrated operation for the same look & feel display of hybrid PLC function blocks on the DCS HMI. The ability to access the hybrid PLC function blocks in the DCS HMI makes possible the automatic generation of tuning windows and trend windows, substantially improving engineering efficiency. Through the seamless integration of independent utilities in a centralized monitoring and control system, an entire plant can be monitored and operated in real time from the DCS HMI, increasing the utilities' efficiency and operational safety.